Hello world! It's Alex the intern again, broadcasting to you live from Crazy Town, USA! The friendly city of Crazy Town. Crazy Town was founded by esteemed comics creator, Beth Hetland, for a collaborative comics project. Once a small scale model of a university campus, Crazy Town has evolved into a complex city known for its unique architecture, complex infrastructure, and complete lack of foliage. Crazy Town has a thriving artistic community. 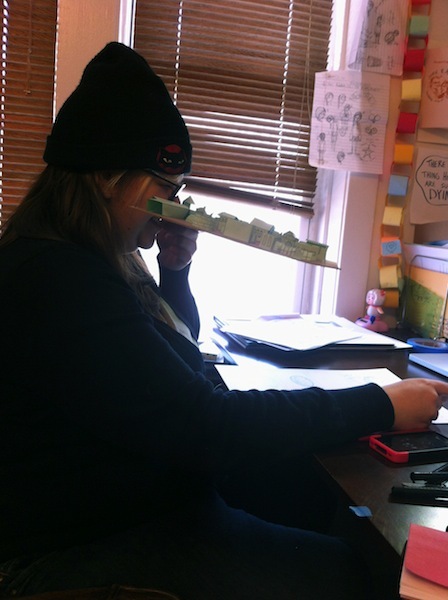 After leaving her comics career to become a full-time origami architect, Hetland has been a true pioneer for the arts here in Crazy Town. Pictured above is Claes Oldenburg's famous "itty bitty spoon bridge and tiny cherry," a Crazy Town landmark. With Hetland's help, Crazy Town's reputation as the epicenter of the modern art world has reached far beyond its tiny green walls. The entrance to Crazy Town. Beth Hetland, current Mayor of Crazy Town, would like to tell the world that "The Gates to Crazy Town are always open!" The designer/architect/mayor of Crazy Town admiring her fair city. "come my lady, come come my lady, you're my butterfly, sugar, baby"